The winners of the World Land Trust (WLT) International Trail Camera Competition, in association with The Times, have now been revealed – but let’s not overlook the wonderful range of images entered into the competition. These images may not have won a prize, but they all have a story to tell. 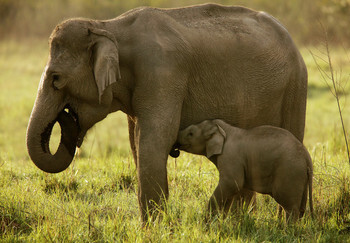 By chance, several of the images shortlisted illustrate the bond between mothers and offspring. And, with Mother’s Day approaching, we take this opportunity to showcase some of the images that celebrate the mothers of the wild world. This Grizzly Bear (Ursus arctos ssp) with her two cubs was photographed in Alaska by Conservation Science Partners. The large sow is having a good scratch while two of her three cubs play on the tree and attempt to imitate her. 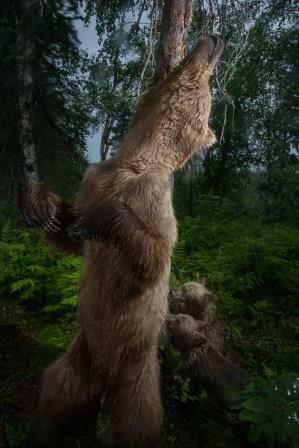 By reaching high into the tree, the mother is displaying to other bears her towering size, something her cubs must learn to do if they are to survive into adulthood. She is particularly thin at this time of year but she will soon become plump as salmon arrive to spawn. Grizzly Bears live up to 25 years of age. Females reproduce between the ages of three and eight, and during these few years they produce up to four cubs every two to three years. Cubs are born in the mother’s winter den in late January or early February, while she is still hibernating. They remain with the mother for two to three years before the mother mates again and produces another litter. Grizzly Bears have one of the slowest reproductive rates among terrestrial mammals and it may take a single female 10 years to replace herself in a population. This female Lesser Anteater (Tamandua tetradactyla) was photographed at Cavernas do Peruaçu National Park, Minas Gerais, Brazil by Instituto Biotrópicos (which also won the People’s Choice award for an image of a melanistic Maned Wolf). 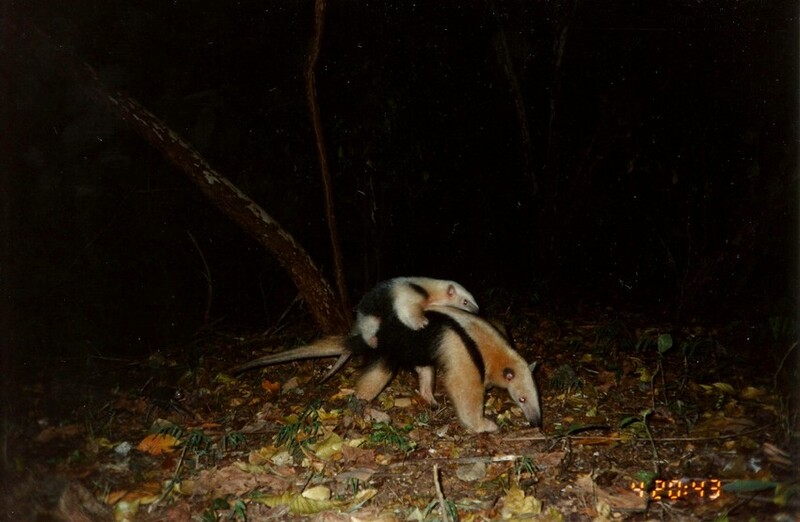 Lesser Anteaters produce one baby in early spring which is cared for by the mother. The offspring is born with its eyes open and with the anteaters’s distinctive giant claws. The mother carries her young on her back while she forages for ants, occasionally leaving the baby safely on a branch while she searches for food. The tamandua’s mouth is round and only as big as a pencil but its sticky tongue is 16 inches long (41 centimetres). With small barbs, the anteater’s tongue is a fearsome weapon against ants and termites; it can also lick up honey and soft, juicy fruits. The Honey Badger (Mellivora capensis) has earned itself a place in the Guinness Book of World Records for being the most fearless animal on earth: they have even been known to fight off lions and leopards. This mother is carrying her cub in Ngamiland District, Botswana where she was photographed by a trail camera installed by Botswana Predator Conservation Trust. The image shows a mother moving her youngster from the nursery chamber at an age when it must begin to learn important hunting skills. The female Honey Badger digs a nursery chamber in which to give birth after a gestation period of six to eight weeks. A single offspring is born (rarely twins), which is hairless with pink skin and closed eyes. By the time the cub is nearly three months old, it is a perfect miniature of its parents. It reaches adult size at six months but stays with the mother until it is up to two years of age. During these important years the youngster learns from its mother how to be a fearless and aggressive hunter. 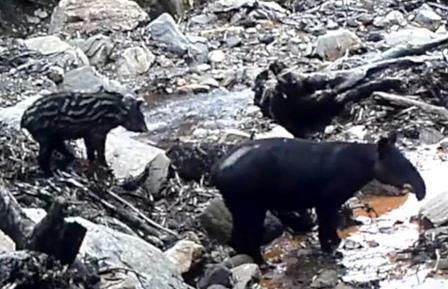 Thanks to remote cameras installed in remote parts of the world, conservationists are building up a fascinating picture of the hidden world of mothers and young in the wild. A Mother’s Day gift to World Land Trust will help the Trust conserve the natural habitat that these wild mother’s need to breed and survive. Please give generously.